FOCUS+Fragile Kids is an organization that helps children who are medically fragile or have significant developmental and/or physical disabilities. They comfort children and families with hospital visits and support groups, offer hope by information and education, provide fun activities for parents and kids, and help to make equipment available to children in need. In the fall of 2017, FOCUS+Fragile Kids received a grant award from the Catholic Foundation. This $2500 grant enabled this important non-profit to provide a Convaid stroller to a child and family in need. Often, basic equipment for these medically fragile children is not covered by insurance or Medicaid. The recipient of this life-changing stroller was Mikayla. Mikayla is an 8 year old girl who lives with her family in Floyd county. Her grandmother Charlene said that the “super-cool, fire engine red” lightweight stroller helps Mikayla to have the best possible quality of life. 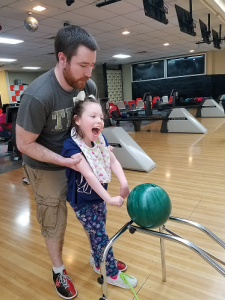 It has enabled Mikayla to go places, see things, and participate in activities that previously were not possible when using a heavy motorized wheelchair. Charlene said that Mikayla (who is diagnosed with from Schizencephaly, a developmental birth defect of the brain) is so much more than what you see. “Just because she cannot walk, does not mean she’s not going places. This little girl is a powerhouse…a force to be reckoned with! She will never lie down, give up or settle for being labeled as disabled or discounted as a second-class citizen. She will not sit idly by and be ignored. Never underestimate the power of this strong-willed child. Tell her she cannot do something and she will. Tell her she is forbidden to do something and she will. Tell her she is not capable of doing something…not a chance!” said Charlene. Mikayla is not the only child waiting on equipment that could change the way she goes through life. FOCUS-Fragile kids has 10 families on a waiting list for a Convaid stroller, and a much larger number waiting for other critical equipment. If you would like to make a gift to provide grants to help worthy organizations such as FOCUS+Fragile kids well into the future, please click here.